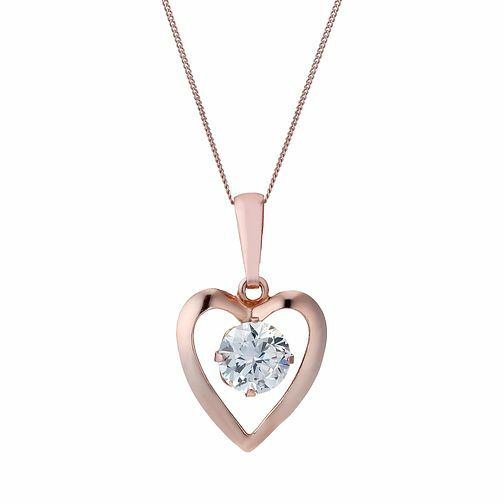 A pretty cubic zirconia set heart shaped pendant, crafted in sumptuous 9ct rose gold and finished with a 16" chain. 9ct Rose Gold Cubic Zirconia Heart 16" Pendant is rated 3.8 out of 5 by 4. Rated 4 out of 5 by Anonymous from Lovely bridesmaid gift I had two bridesmaids who have different tastes when it comes to gold colour/type. This item was available in both rose gold and yellow gold so I was able to give them matching gifts that they both loved.